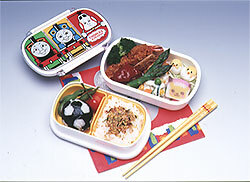 Box lunches (bento) are very popular among Japanese kids and adults alike. People take them to work, to school, on picnics, and so on. Half of a typical bento consists of rice, and the other half consists of several side dishes made with such ingredients as vegetables, meat, fish, and eggs. This format allows for infinite variations. The most common side dish is some kind of cooked egg, such as tamagoyaki (omelette strips or squares cooked typically with salt and sugar), fried eggs, scrambled eggs, and omelets with various ingredients. Another perennial bento favorite is sausage. The creator of the bento sometimes makes little cuts in the sausage to make it look like an octopus or other animal, adding to the fun of the meal. Other popular items include grilled fish, fried meat, fish cake, and vegetables of various kinds. The vegetables may be pickled, boiled, or steamed; cooked vegetables are used more often than fresh ones. For dessert, there might be an apple or tangerine. One long-standing staple of bento is a pickled Japanese apricot, or umeboshi. This traditional food, believed to prevent rice from going bad, may be placed inside a rice ball or on top of a bed of rice. The person who makes the bento, such as the mother of the household, often prepares the box lunches as she is cooking the side dishes for the family's regular meals. She considers which dishes would not go bad so quickly and sets a portion of these aside for the following day's bento. Indeed, the mother often plans the family dinner around items that will make good leftovers for the next day's bento. Japanese people attach great importance to the appearance of their food. Part of the fun of making a box lunch is creating a visually appealing arrangement that will whet the appetite.